Pisang Peak (6091m) is one of the most admired among the trekking peaks in Nepal in the Annapurna Himalaya range. Pisang Peak mounts climbing above from Pisang village and yak pasture in a consistent slope of ice and snow to the final summit. It is considered one of the natural climbing peaks among the trekking peaks in Nepal. The path ascends through sparse wood and pasture to reach the base camp from Pisang village to a Kharka (4,380m) which is the best place for setting up the base camp. 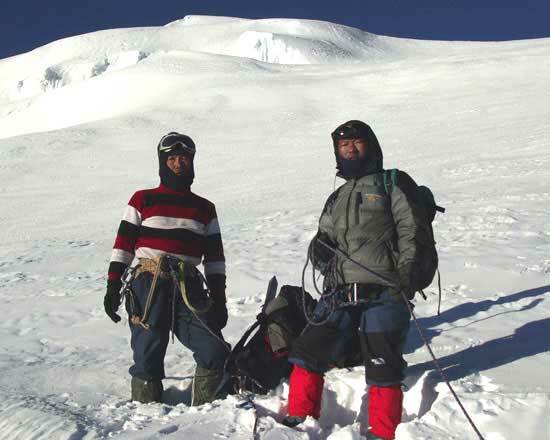 High Camp is set up at (5,400m) climbing to a shoulder on the South-West Ridge. Pisang Peak climbing begins from Besisahar from the Valley of the Marsyangdi River. 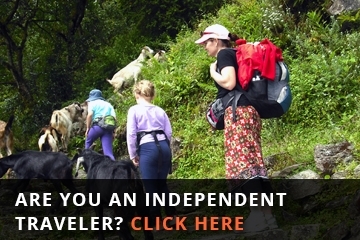 The path takes you through very distinct animals and plants and sees the rewarding outstanding peak of Mt. Manaslu, Annapurna, and Lamjung Himal. The most significantly Manaslu trekking track meets at Dharapani while passing through Larkya La. The path from here demands walk to the Pisang Peak. The trek will now take you to a place from where you can seize the view of the entire vista of the Annapurna Himalaya Range. The trail then rises from the Manang valley to reach the top of the Thorung Pass at 5416m. The path then comes up from the Manang valley to reach the top of the Thorung Pass at 5416 m. Hereafter, the famous temple of Muktinath awaits you. 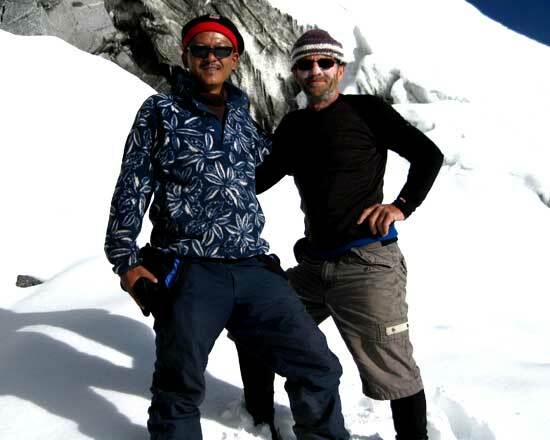 Nepal wilderness trekking designs the Pisang Peak climbing as your hope. 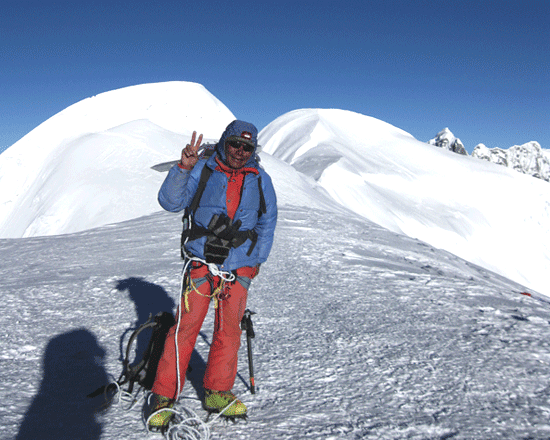 Pisang peak climbing is considered to be among the easier ones of the Himalayan region, yet a high level of physical fitness and health is still required. 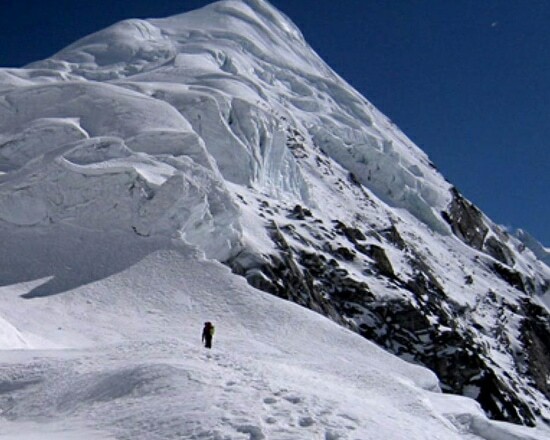 Pisang peak has been started intending for climbing for several mountaineers and adventure seekers. Our Climbing guide is familiar with Pisang peak, many time summits the mountain and well known the route to lead you the summit and safely bring back with fixed rope and leading rope. Day 01: Arrival day in Kathmandu (1,300m/4,264 ft) after you arrive at the Tribhuvan International Airport, our representative of Nepal wilderness trekking welcomes you and assists to transfer in your hotel in Kathmandu. After time to get refreshed, evening you'll meet and transfer for welcome dinner in one of the typical Nepalese restaurants in the heart of Kathmandu and briefing about your trip and overnight at Hotel. Day 02: Drive to Besisahar (830m/2,723ft) Early in the morning, we leave Kathmandu to arrive at Annapurna driving by local bus to Besisahar through the beautiful countryside and river sight. This is an attractive drive through the foothills of the Himalaya. On the way to Pokhara, our path disconnects from the town village of Dumre towards north to Besisahar which is a big town and district headquarters of the Lamjung, see the sights of the surrounding area and we stay overnight at the hotel. Day 03: Besisahar to Bahundanda (1,310m/4,298ft) We start our trek from Besisahar and passing some local wooden and bamboo bridges reaches Bhulbhule, the path continues to Ngadi village for lunch, and again the walk continues passing through waterfall through the river bank before hiking uphill reaching to Bahundanda for overnight. This is a pleasant village on the top of a hill, and you may have the chance to discover the evening time to the local town and around the school areas. It takes five to six hours to reach Bahundanda from Besisahar. Day 04: Bahundanda to Chamje (1,410m/4,626ft) Today, we walk for 5 to 6 hours. After passing through fields and local villages the trek slides down to Syange village. A small downhill hike and crossing a long suspension bridge at Marsyangdi River, we reach Syange. Now, our trek continues gradually uphill from the river and the last steep climb to get to Jagat for lunch stop. From here, we further walk on the rocky path, and long scenic waterfall across the river finally brings you at Chamje for staying tonight. Day 06: Chamje to Dharapani (1,960m/6,430ft) From Chamje, we walk passing through a suspension bridge over the sublime Marsyangdi river, after crossing the bridge it's another steep ascend for another 2-3 hours till Tal. It is the village is located on the gorge-valley by the side of the river Marsyangdi and decorated with beautiful waterfall and sandy spread river. Additionally, the trek follows the upstream up to the Dharapani, which is through the rocky trails and crossing few suspension bridges and small teashops bring you at quite a large village at Dharapani for the overnight at hotel. Day 07: Dharapani to Chame (2,710m/8,891ft) To reach Chame from Dharapani, this day we walk for 6-7 hours. Hame is a district headquarter of Manang District, and you will witness the changing vegetation, people and the landscapes too changes and the air will get cooler, the path then climbs through pine forests to Bagarchhap, the first village on the trek with distinctive Tibetan architecture. After an enjoyable walk to Bagarchhap. You will have a first striking view of Annapurna II and Lamjung Himal from here. Day 08: Chame to Pisang (3,700m/12,139ft) The path heads off from the other side of the river on the northern bank passing through pine woods and small villages with few ups and downs till you reach the orchard village of Bhartang, a village of apple garden. Then, we continue on the gradual path up to a bridge, from the bridge a short steep climb through the pine forest brings you at the top of the ridge of Dhukure Pokhari for lunch. After walking out of the tree line, a great view of Pisang peak on the north and the Chulu peak can see with Pisang village. From this top, a gentle descent of one hour brings you to windswept village of Pisang for overnight. Explore Pisang villages and its riverside and overnight at the lodge. 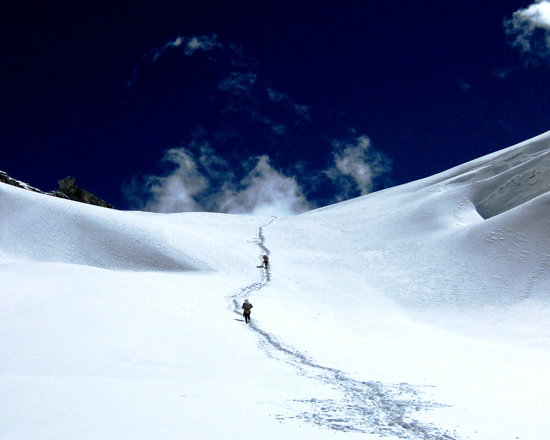 Day 12: Summit Pisang Peak (6,091m/19,980ft) and hike back to Upper Pisang (7-9 hrs) From the High Camp, today, the distinct well ridge leads you to the concluding snow incline which is quite steep and more challenging to reach the summit. Our climbing guide will be fixed the rope and direct you to the successful summit of the Pisang peak. We then return to Base camp to Upper Pisang for overnight. Day 13: Climbing Reserve Day We have a rest day today in case if the climate gets bad or if any participant does need to prepare longer for any reason. It is vital to have this day as it entirely risks to try to peak to Island Peak while the weather is not favoring us. Day 14: Upper Pisang to Manang (3,500m/11,482ft) 4-5 hrs Today we descend to Pisang village and keep on walking towards Manang valley. We now, take a steady climb up for half an hour for reaching the top, stop at a ridge to get our first view of the Manang valley. This inspiring mark offers splendid views of the valleys, Humde village with its short air-strip and the magnificent peaks of Gangapurna, Annapurna II, III, Tilicho and on the right Chulu east, on the back Pisang peak. The walk moves further to Humde and pleasant walk up to the Braga village for conventionally built up Tibetans style of houses. From here flora changes, you will notice a contrast of landscape and dry mountain hills. From Bhratang, half an hour walk reaches to Manang for the overnight. Day 15: Acclimatization day at Manang (3,500m/11,482ft) Manang is an acclimatization day and to explore Manang. Manang is the village of about 500 flat-roofed houses which is the arresting set surrounded by some fabulous scenery -Annapurna II, Annapurna III (7,555 meters), Gangapurna (7,454 meters) to the South - Tilicho (7,132 meters) and the Grand Barrier to the West - Chulu West (6,583 meters) and Chulu East (6,059 meters) to the North. Day 16: Manang to Yak Kharka (4,110m/13,484ft) This day, our path leads to a slow mount for an hour to the Tenki Manang for witnessing the view of the Annapurna, Gangapurna and Tilicho peak. The track gently winds up offering breathtaking views and through terrains with juniper bushes as the only surviving vegetation around this region and will brings you at Yak-Kharka for the overnight. Day 17: Yak Kharka to Throng Phedi (4,400m/14,432) We start our hike with unhurried pace to Phedi which means 'foot of the hill.' We still have the same breathtaking view of mountains and landscapes. After an hour walk, we reach Ledar and continue to climb along the east bank of the Jorsang Khola, and then move down and cross the stream on a wooden bridge to get a small tea shop. We stop for the fantastic view and tea breaks, and we follow a narrow path across a high, unstable slope before heading to Thorong Phedi for the overnight. Day 18: Throng Phedi to Throng La (5,416m/17,765 ft) to Muktinath (3,800/12,467ft) 7-8 hrs We today, have the longest and challenging day of the whole trip. 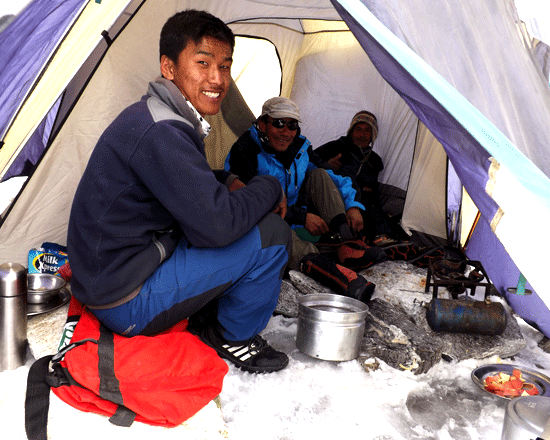 We begin our walk early in the morning; today the track becomes steepest firstly and reaches high camp. Walk on your own pace viewing with sunrise and sight of the mountains. We continuously walk to the top takes 3-4 hrs to the Throng top and with a great feeling of victory take a short break for picturesque scenery and down to the Mustang part of mountains and the Kaligandaki valley far below to the West. Lastly, we made to Muktinath after 7-8 hrs long walk and overnight at lodge. Day 19: Muktinath to Jomsom (2,570m/8,430ft) 5-6 hrs We visit Muktinath in the morning and continue our journey descending downhill to the Kaligandaki river valley. From here onwards the valley gets the very windy path, the walk follows the gentle trail for another two hours till the large town of Jomsom a town and a headquarter of the Mustang region with a small airstrip just above the Kaligandaki River, where we’ll stay overnight at teahouse and next day morning fly to Pokhara. Day 20: Jomsom to Pokhara by Flight (25 minutes) We today fly from the deepest gorge of the world between two huge mountain range of Mt. Annapurna and Mt. Dhaulagiri with many snow-capped peaks. Upon your arrival at Lake Side of Pokhara valley, the guide will transfer to your hotel and after check-in leisure at your own. Day 21: Pokhara to Kathmandu (1,300m/4,264 ft) 6-7 hrs drive We pass through the picturesque countryside early in the morning. It takes 7 hours back to Kathmandu. 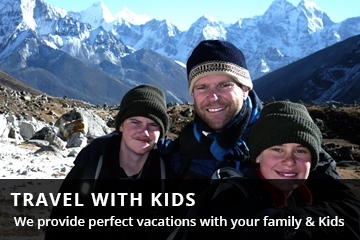 On arrival at Kathmandu, the guide will transfer to the hotel and rest of the day relax or explore the surrounding areas and overnight at hotel.